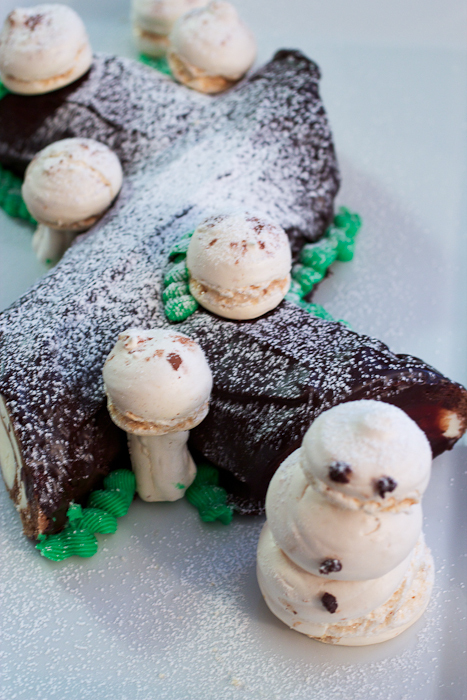 For christmastime this year, impress your family and friends with a Triple Chocolate Buche de Noel complete with meringue mushrooms and a snowman to decorate your table. Close your mouth please. I see the look of shock and dismay and the question being formed of what is going on here? This year with Chanukah falling so early, I thought perhaps it might be time to bring out some Christmas and general holiday/festive related recipes. Just because it isn’t my holiday, doesn’t mean I shouldn’t keep all of you – my wonderful readers in the dark with some yummy treats when it just might be your holiday. Am I right? There is no better time to kick off this holiday treat-palooza than with my #HolidayFoodParty gang! We have 10 irresistible desserts lined up today that will keep you set for all your gatherings and edible gift givings this season. I figured if I was going to venture into new blog topic category, I might as well give myself a challenge. I love buche de noel’s or otherwise known as yule logs. I’ve purchased the famed ones from Payard’s bakery in NYC, watched them be made on food tv for years but never attempted it myself. I remember making roll cakes with my mom when I was young, but this is an entirely different beast. Besides the genoise cake, there are a million options for the filling, frosting and whether to go all out with the meringue mushrooms or not. As you can see – I did. This cake isn’t hard, it just takes time and patience and in the end you will justly rewarded with a richly delicious, intensely chocolate cake. Click on each picture to take you to the recipe! Heat your oven to 425 degrees F. Line a quarter-size jelly roll pan (approx. 15 1/2X 10 1/2 X 1inch) with parchment paper. In the bowl of your stand mixer, fitted with the whisk attachment, whisk the whole eggs, egg yolks, 1/3 cup of sugar and milk on medium-high for about 6 minutes. You want the mixture to be light and have tripled in volume. Transfer the egg yolk mixture into a bowl and clean your mixing bowl completely. Place the egg whites in the clean bowl and whip on medium until foamy. Add the remaining 2 tablespoons of sugar, one tablespoon at a time and then raise the speed to medium-high. Whip until the egg whites have form stiff but not dry peaks. With a rubber spatula, carefully fold in half the whole egg mixture into the egg whites. Once mostly added, fold in the remaining, being careful not to deflate the batter. Sift the flour and cocoa powder over the batter and then gently fold into the egg whites, scraping the bottom to make sure everything is combined. Carefully scrape the batter onto the prepared baking sheet, spreading evenly without deflating. Using a sifter or fine mesh sieve, dust the powdered sugar over the top of the batter. Bake for 5 minutes or until the cake begins to brown on the edges. Remove from the oven and place a piece of parchment paper on top, as well as rimless baking sheet. Immediately flip the cake over and out of the baking pan. Use a pairing knife to loosen the edges and carefully peel back the parchment paper. Let cool completely. While the cake is cooling, clean out the mixing bowl for your stand mixer and replace the whisk attachment with the paddle. Add the butter and powdered sugar to the bowl and beat on medium speed until combined and smooth. Add the vanilla extract,salt and white chocolate, beat again to combined well. If the white chocolate was still a bit warm and broke your buttercream when you added it, place the filling in your freezer for a few minutes to set up. Brush the chocolate simple syrup on the cake and spread an even amount of buttercream to edges, leaving about 1 cup for decoration. With the long edge towards you roll the cake. Wrap in plastic wrap and place in the refrigerator for 4 hours or up to 1 day ahead to set. Add green food coloring to the remaining buttercream for decoration. In a small saucepan over medium heat bring the heavy cream to a simmer. Place the chopped chocolate in a medium bowl with the salt and pour the heavy cream over. Let sit for 2-3 minutes and then stir until completely melted and smooth. After about 5-10 minutes the chocolate ganache should be nice and thick and ready to frost the cake. Remove the cake from the fridge and remove the plastic wrap. Cut about 2 1/2 inches from each end on a diagonal for the tree knobs and place at your desired points. Cover the tops and sides with chocolate ganache and place back in the refrigerator to set. The meringues can also be made ahead of time and kept in an airtight, dry container. Heat your oven to 275 degrees F. and line a baking sheet with parchment paper. In the bowl of your stand mixer fitted with a whisk attachment add the egg whites and beat until foamy on medium speed. Add the granulated sugar one tablespoon at a time until the egg whites start to increase in volume. Increase the speed and add the remainder of the sugar and cream of tartar. Beat until stiff but not dry peaks form - takes about 5 minutes. Then lower the speed and beat for another 2 to incorporated more air. Remove the bowl from the mixer and with a rubber spatula fold in the powdered sugar, making sure not to deflate the egg whites. Transfer to a pastry bag fitted with a 1/4 inch tip. To make the mushroom stems, pipe 1 inch long rods on the parchment paper. For the mushrooms caps, pipe 1/2 inch rounds or slightly larger of you like. For the snowman, make rounds in varying sizes to be stacked. Dust the mushroom caps lightly with cocoa powder. If any of the meringues have tips, wet your finger and press it down gently. Bake for 1 hour with the oven door slightly ajar. If the meringues start to take on color, remove the baking sheet lower the heat and add it back in. Once they have finished baking, turn off the heat and let the pan cool completely in the oven for 1 hour. To put the mushrooms together with a sharp knife cut the edges of the stems so that they are flat and with the extra buttercream glue them together. You may have to cut the bottoms of the snowman so they will stack on top of each other and you can also glue them together with buttercream. 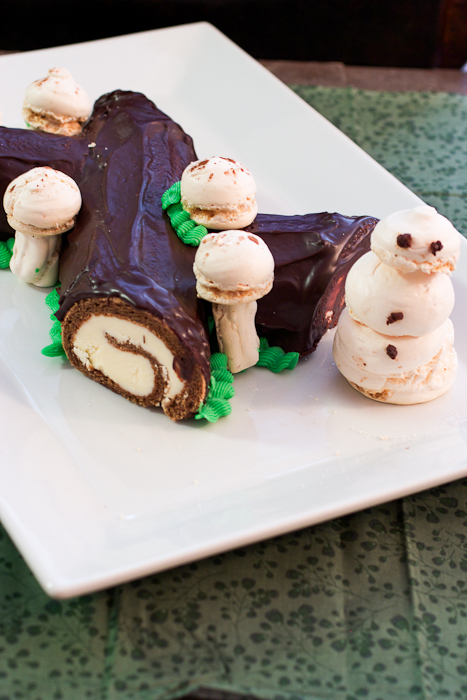 To finish the buche de noel - just prior to serving, bring to room temperature decorate with the green buttercream and add the mushrooms and snowman. Finish with a sprinkling of powdered sugar to make it look like snow. The cake and meringue recipe was adapted from Jacques Torres's Buche de Noel from A Year In Chocolate. A few notes, I used a lot of buttercream in my filling, mostly for looks. The cake is quite rich with this amount, please adjust for your tastes and half the recipe if you don't want as much. Well this looks unbelievable Susan! I don’t know anything that says Christmas like Buche de Noel. I love the additional touch of mushrooms and snowman. Thank you so much! This was definitely a labor of love, but I’m so happy I stuck with it and made it happen. A proud moment for sure when everything was complete. aw Susan I love you! So inclusive to make such a delicious Christmas-y treat, plus it’s GORGEOUUUUS! it’s so crazy how early Hanukkah was this year! I’ve never had a yule log before, but now I want one! You deliver, right? I’ve made an amateur version of this before….but yours is a masterpiece! 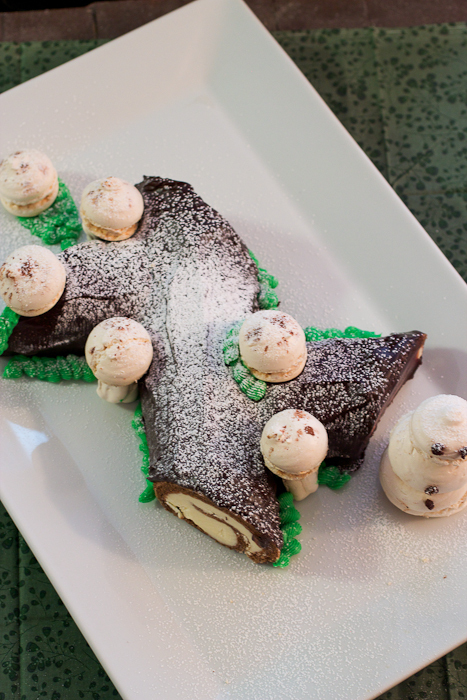 I love the white chocolate filling…the whole thing is so festive! Beautifully done!! Oh wow… talk about a work of art! I am loving all those adorable little meringue mushrooms! I’ve never had the patience or the energy to tackle a Buche de Noel for the holidays, but maybe this is the year I actually roll up my sleeves and take on the challenge. A Buche de Noel is something I’ve always wanted to make. Now I can use this as a guide and something to aspire to. What cute little meringue mushrooms and snowman too! The buche looks really good! I know you put a lot of work into it. This dessert is a work of art! what a really pretty cake. I just love all the details!